A black and white photograph of 1190 Dundas Street West. Matthias Mackey (1765-1856) was born in New Jersey and was on of Whitby's earliest settlers. He settled on 100 acres of lot 32, Concession 2, Whitby Township, between 1810 and 1817. His home was built very close to Highway 2 (Dundas Street) as it appears in this picture. 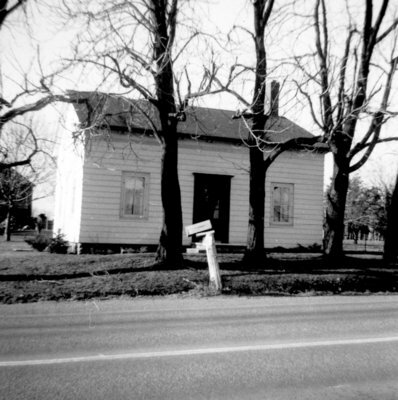 When Highway 2 was expanded from two to four lanes in 1973, the Mackey house was moved some distance back from the road. Five generations of the Mackey family have lived in this house. 1190 Dundas Street West, April 6, 1969, Brian Winter. Whitby Archives A2013_004_011.